1. great skin home and away set promotion by Clinique. 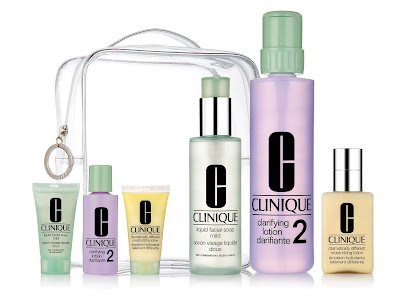 syiokkk 700% if i could have this, merry clinique! great gifts, great values. the set separately if i didn't get the chance to have the Christmas set (above picture). 2. 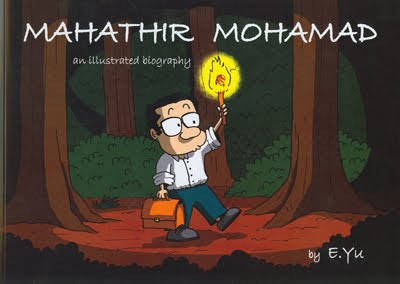 Mahathir Mohamad biography. another must-have list for the birthday. 3. Calendar alarm. 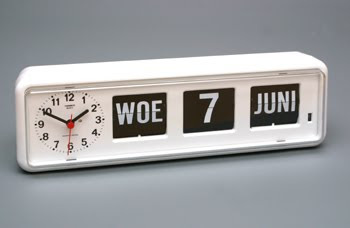 table clock that have the date. kalau tak dapat jam tangan asalkan ada jam ni pun jadi lah. please let me have all that i've listed. p/s: most of all, I thank Allah for this year birthday is a blast to me since i've been given the best present of all. Alhamdulillah. first of all, happy new year to all muslims around the world. awal muharam of 1432 hijrah is today as we hear of maghrib azan. Alhamdulillah, God had given us life to stood here still and witness His beautiful creature across the nation. I'm back to hometown, Johore to celebrate my cousin's son birthday and aqiqah. the son is turning 1 on 7th December which is equal to awal muharam 1432 this year. Life had been upside down for me this few days but I believe that everything happens for reason and that's what makes me stronger and always try my best to look into brighter sight. i'd like to share some pictures taken during those days spent with my family. Bought this yesterday. i finally made my dream came true by having the book of P.S. I love you. It's like i have had the complete set for P.S. I love you since i've already watch the movie and already had the book. haha. entah apa-apa. p/s: at batu pahat. 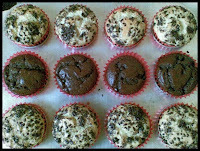 for akikah of my cousin's son. makan. makan. makan. jom cerite lagi pasal upcoming wedding on january 30th. As mentioned, I've been busy for the reception. i'd like to share some part of me doing the decoration for the door gifts. above is some of the photos. join the wedding and you'll know. excited! berterabur kan? biasalah rumah kalau dah nak buat kerja kawin ni. 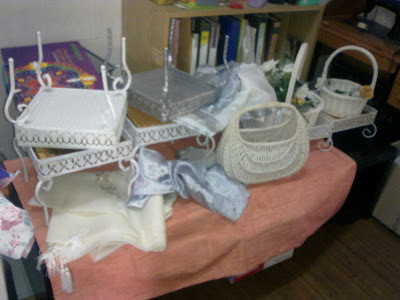 most of the items used here been bought from PISB since we're a member of the store. :) siap dapat discount lagi. will update soon for other stuff. it's December again. I love the month since it'll be my birthday and there's also YES held in Malaysia now so i could have like so much of present since it's YES. haha. perasan. I don't expect the present from people. I'm glad with what i have now. Alhamdulillah. 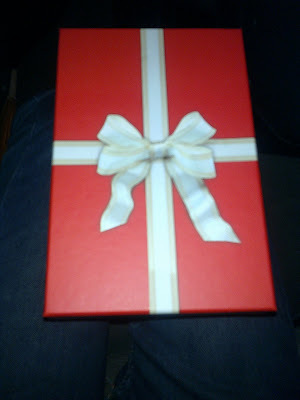 besides, I rarely give presents to others i must say but i did the effort to wish them happy birthday. i have the intention to bought them but apparently i have no money. haha. so, what you give, you'll definitely get back lah. i'm fine with it. i son't mind bout the present as long as i'm alive and that God give me prosperous and healthy life, that'll be great to me; a great present that i could have from God so as long as i live that i could take care for the parents. that's all. 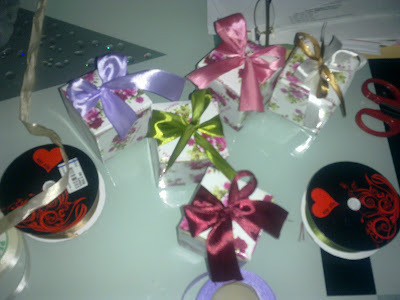 Been busy lately with things for the brother's big day (yes. again and again) my mind can't stop thinking bout it. actually me and the mother been struggling for this big day. he's the first child. 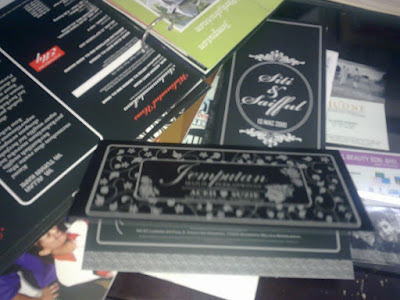 apparently, his wedding reception would be our first time experience dealing with the event. how excited. we're quite terrify i must say. there's always hurdle here and there for this is our first time doing this perhaps we're still lack and therefore we try to consult and ask others who have experience. luckily mama have lots of friends that could help us through it all. alhamdulillah. praised to God for giving us strength and not giving up so easily. i believe that we'll manage it through. insyallah. i just hope that everything will work well for his big day. I know when the time comes me and mama would be the one who'll feel satisfied the most as compare to others. haha. (boleh pula aku cakap macam ni). really, we've been through all. i pray a lot to God to let the event go on smoothly. amin. walaupun dengan pelbagai dugaan dan cabaran nampak gaya kitaorang berjaya gak siapkan beberapa perkara penting sebab tukang masak (import dari batu pahat johor), kad jemputan, buffet set, pelamin+mak andam+baju bersanding dan main table dah di book. barang untuk hantaran pun dah tersedia tinggal nak decorate je. excited lagi sekali. 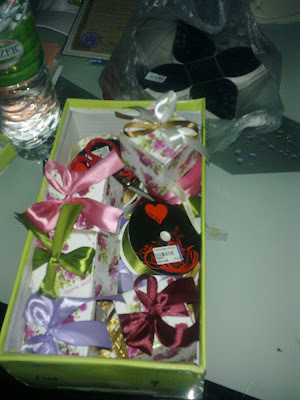 then, souvenir nak bagi orang pun dah sedia tinggal nak letak ribbon left with VIP's souvenir je ni. luckily the event is only for about 500 people sebab mama plan to just buat kenduri lagipun ni majlis anak lelaki (bertandang). mudah-mudahan tuhan permudahkan majlis kami yang mulia ni. doakan lah bersama untuk kedua bakal mempelai ini ye? terima kasih. p/s: serabut. macam-macam berlaku sampai urusan aku sendiri pun jadi kucar-kacir. tapi aku ikhlas nak buat semua ni. aku tahu tuhan menduga. setiap masalah ade penyelesaiannya dan aku bersyukur setiap kali bila di timpa musibah tuhan pasti akan tunjukkan jalan keluarnya.